Dutch bangla bank Limited (DBBL) job circular 2018 has been published on Bangladesh Protidin. 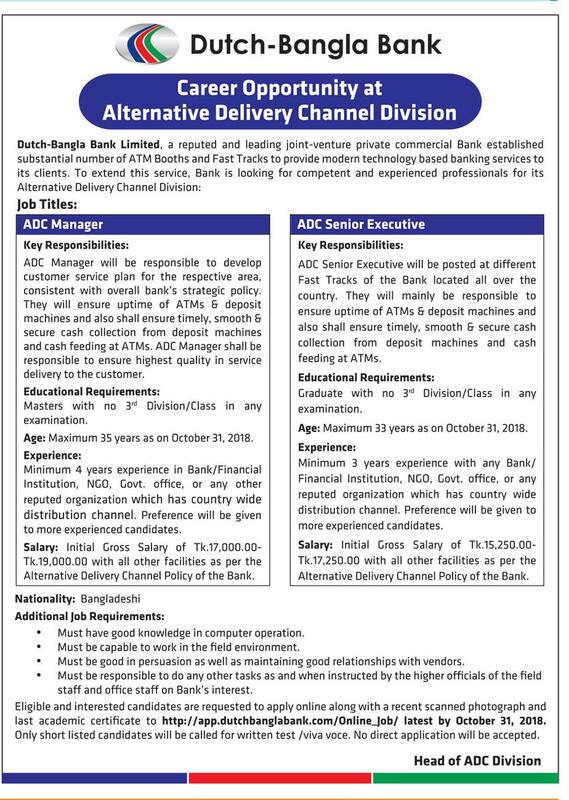 If you want to apply for this job, you should submit your application within 31 October, 2018.
a. ADC Manager will be responsible to develop customer service plan for the respective area, consistent with overall bank’s strategic policy. b. They will ensure uptime of ATMs & deposit machines and also shall ensure timely, smooth & secure cash collection from deposit machines and cash feeding at ATMs. c. ADC Manager shall be responsible to ensure highest quality in service delivery to the customer. d. Educational Requirements: Masters with no 3rd Division/Class in any examination. e. Age: Maximum 35 years as on October 31, 2018.
f. Experience: Minimum 4 years experience in Bank/Financial Institution, NGO, Govt. office, or any other reputed organization which has country wide distribution channel. g. Preference will be given to more experienced candidates. h. Salary: Initial Gross Salary of Tk.17,000.00-Tk.19,000.00 with all other facilities as per the Alternative Delivery Channel Policy of the Bank. Last date of apply 31 October, 2018. 1. Key Responsibilities: ADC Senior Executive will be posted at different Fast Tracks of the Bank located all over the country. They will mainly be responsible to ensure uptime of ATMs & deposit machines and also shall ensure timely, smooth & secure cash collection from deposit machines and cash feeding at ATMs. 2. Educational Requirements: Graduate with no 3rd Division/Class in any examination. 3. Age: Maximum 33 years as on October 31, 2018. 4. Experience: Minimum 3 years experience with any Bank/Financial Institution, NGO, Govt. office, or any reputed organization which has country wide distribution channel. 5. Preference will be given to more experienced candidates. Alternative Delivery Channel Policy of the Bank. 5. Last date of apply 31 October, 2018. Dutch Bangla Bank Limited (DBBL) authority Mobile SMS declaration will be published Admit Card. Every applicant can download login with User Id and Password at http://app.dutchbanglabank.com/Online_Job/. Dutch Bangla Bank Limited (DBBL) authority Mobile SMS declaration will be published Seat Plan and Exam Center at your Admit Card. You can download Admit Card login with User Id and Password at http://app.dutchbanglabank.com/Online_Job/. Dutch Bangla Bank Limited (DBBL) authority will be published at their Official website notice board https://www.dutchbanglabank.com/. 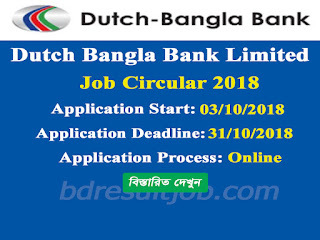 Tags: DBBL, dbbl online banking, dutch bangla bank limited, dutch bangla bank career, dutch bangla bank job circular, dutch bangla bank job, Dutch Bangla Bank Limited (DBBL), employment bank, bank careers, jobsbank, bank job vacancy, bank recruitment, all bank jobs, recent bank jobs, application for bank job, jos a bank, career bangladesh, job search in dhaka, www bangladesh bank recruitment, bangladesh all bank list, dhaka all jobs,dutch bangla bank mobile, bangladesh bank job apply, dutch bangla mobile banking, dutch bangla bank internet banking, dutch bangla bank online, dutch bangla bank, dbbl internet banking, dutch bangla internet banking, dbbl agent banking, dutch bangla bank online registration, dasbangla bank, dbbl bank, dutch bangla bank customer, dutch bangla bank internet banking, online job circular, dutch bangla bank call center, dbbl internet. 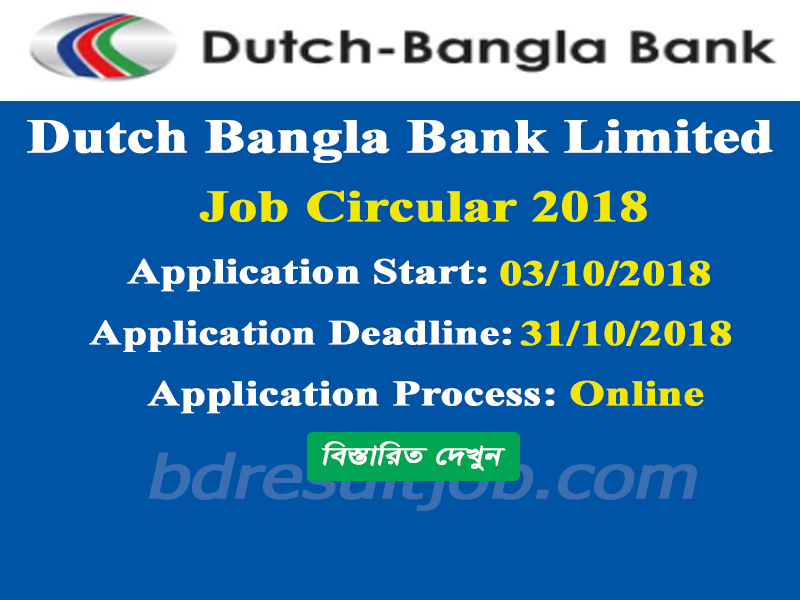 DBBL, dbbl online banking, dutch bangla bank limited, dutch bangla bank career, dutch bangla bank job circular, dutch bangla bank job, Dutch Bangla Bank Limited (DBBL), employment bank, bank careers, jobsbank, bank job vacancy, bank recruitment, all bank jobs, recent bank jobs, application for bank job, jos a bank, career bangladesh, job search in dhaka, www bangladesh bank recruitment, bangladesh all bank list, dhaka all jobs,dutch bangla bank mobile, bangladesh bank job apply, dutch bangla mobile banking, dutch bangla bank internet banking, dutch bangla bank online, dutch bangla bank, dbbl internet banking, dutch bangla internet banking, dbbl agent banking, dutch bangla bank online registration, dasbangla bank, dbbl bank, dutch bangla bank customer, dutch bangla bank internet banking, online job circular, dutch bangla bank call center, dbbl internet.